* Acrylic desiccator cabinets are susceptible to damage with the prolonged use of alcohol and other cleaning/disinfecting agents. Desiccator cabinets fabricated out of Static Dissipative PVC may be a better choice in these instances. ** It is highly recommended that stainless steel shields be installed in Static Dissipative PVC desiccators to protect the chambers bottom surface from repeated scraping and rubbing, which can lead to loss of dissipative properties. Amber acrylic desiccator cabinets are ideal for storage of materials and devices that are sensitive to ultraviolet light. Pre- tapped inlets/outlets for connection of optional gas purge devices & controllers and Auto-Adjust™ RB (relief/bleed) valve. Static-dissipative PVC desiccator cabinets provide added contamination control by dissipating static charges that attract air-borne particulate. Exterior removable back plenum panel is made of non-dissipative material. Static dissipative PVC available upon request (at additional charge). * Acrylic shelves should not be used with static-dissipative PVC desiccator cabinets. Stainless steel shields being purchased for installation on clear and amber acrylic desiccator cabinets, should be considered with the addition of desiccator grounding (optional). See Grounding (desiccator) option below for further information. Shields are factory installed. When purchased for use with a static-dissipative PVC desiccator, the shields will be installed and connected to the system grounding, which is a standard feature on these cabinets. Select the appropriate quantity needed for the selected desiccator cabinet(s). Note: It is recommended that stored materials, whenever possible, be distributed evenly though-out the storage chamber and not centrally located in the center of the chamber as to minimize un-necessary damage to the desiccator cabinet. Quick-Connect, Push-to-Connect Couplings:A slim body makes these plugs and sockets great for use in tight spaces. These “brass” couplings are single-shut-off style, so there is a valve in the socket but not the plug. Not rated for vacuum. NPTF (DrySeal) threads are compatible with NPT threads. Push-to-Connect Sockets – To connect, push plug into socket until you hear a “click.” To disconnect, slide sleeve forward until the plug ejects. All have a Buna-N (nitrile) seal. These sockets are only for use with the plugs in this presentation. Male plug features a 1/8″ pipe size NPTF, which can be connected (threaded) directly into the desiccator cabinet or to the optional Flow Meters listed below. 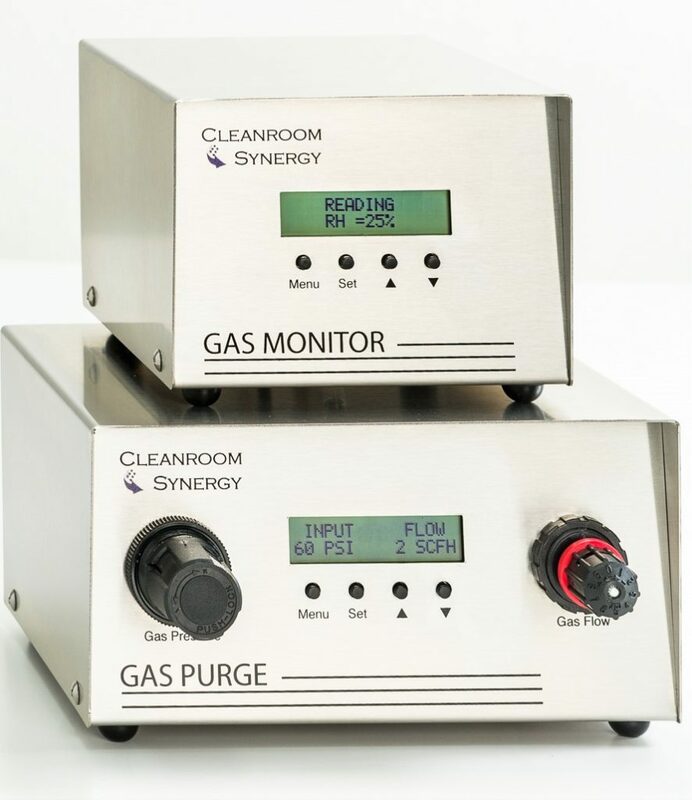 For automated control over low R/H levels (0% to ambient RH) or for complete R/H control (0% – 100%), select the optional Gas Purge™, Gas Monitor™ and Sonic Humidifier™ control systems listed in the “Gas Control Solutions” section of this page. Static Dissipative PVC features a surface resistivity of approximately 107 ohms/square that dissipates static charges from the cabinet’s surface. Grounding is standard on Static Dissipative PVC desiccators, which safely directs charges to a multi lug termination grounding block. To protect the Static-Dissipative PVC interior bottom surface, it is “highly recommended” that a stainless steel shield be installed in each desiccator cabinet chamber. Stainless steel shield installation includes connection to the desiccators grounding. Acrylic (clear and amber) desiccators can also be fitted with grounding by purchasing the optional “Desiccator Grounding”. Charge for the desiccators grounding is per chamber. Stainless steel shield installation within these cabinets, include connection to the desiccators grounding if optional grounding is purchased.